Every day, thanks to modern telecommunication technologies, we are overwhelmed by a huge amount of data. But we cannot perceive and digest it all, so most information is lost. Information visualization can help people to find, select, and interpret this information effectively. Until recently infovis was a specialist discipline. Now, thanks to the development and spread of the user–centered web, information and its visualization is available to a wider audience. Dropple is an interactive web application which shows global statistics about the water crisis in a thought-provoking manner to help people better understand and reason about the problem. At the same time Dropple tries to raise awareness by providing people with a framework for monitoring and analysing their lifestyles and their impact on society in a simple way, and help them change their behaviour. 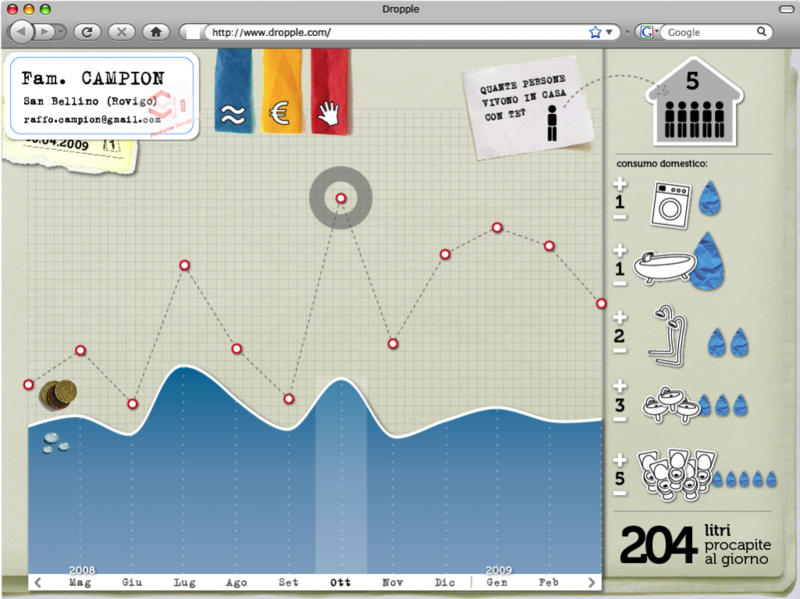 Dropple is a tool designed for common people in both content and graphic-design points of view. The project aims to achieve simplicity and immediacy through good design, spontaneous interaction and an engaging graphic mood. After a simple and fast registration at the company site which manage water on your geographic area, you enter on Dropple system which picks information about your water consumption from the company database and show you different aspects of you data. Through three menus the application presents statistics about water consumption or related economical point of view, or it lets you play with your numbers to better understand them and their effects on a larger scale.